At the end of the school year, it's hard to keep your students' attention. Therefore, it's time to change things up a bit. Here are a couple of reading games to use now...or anytime. How to Play - This is a version of tag. One person is It. All the students run around trying to get away from the person that is It. If a student needs a break, they may loudly (the person that is It needs to hear them) start reading their book. You can have a certain time set for each game. I usually give 2-3 minutes per round, so multiple people have a chance to be It. Variations - Multiple people can be It. Another option is to only have certain areas that are the designated "reading areas." How to Play - I don't play this game the traditional way. Instead, I use this as an opportunity for my students to experience a LOT of books! For this game, each child starts with a book or a bin of books. They read the books. Once the music starts, the students move around the room and find a book/book bin to read when the music ends. This gets them looking at tons of new books they may never have noticed. Variations - You can play it like actual musical chairs, taking a chair away after each round. How to Play - Place stations around the room. These should have books alternated with activity cards. Some suggestions for the activity cards include jumping jacks, push-ups, etc. Students rotate through the stations every few minutes. Variations - Students can start each station with a workout and read the book the remainder of the time. 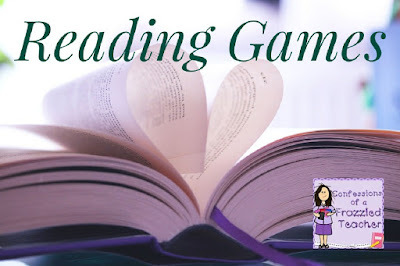 Do you have any suggestions for reading games?